There are few things more enjoyable than going to the range for an afternoon, and there are very few things that are more enjoyable to take to the range than an AR-pattern rifle amd a couple hundred rounds of .223 ammo. The problem is that it is scientifically impossible to take an AR to the range and not go cyclic at least once. Okay, I made up that part about scientific data but the rest is true! Some people have gone as far as to say that .223 Remington ammunition will be the currency of the dystopian, post-apocalyptic future. 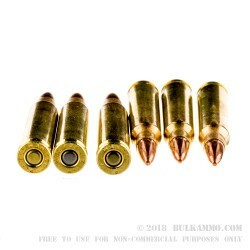 That may be a slight stretch, but it is still something that is a pretty good to have around in bulk volume, which is exactly where Bulkammo.com comes in with this great deal. 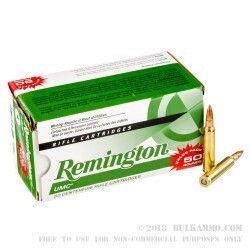 Remington UMC rounds are a cheap option that's ideal for training. 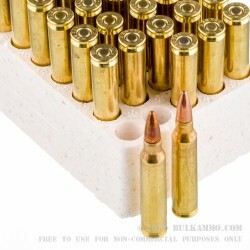 With this ammunition, you can bulk up your supply of battle ready and proven .223 in the versatile 55 grain FMJ loading. This is the best way to zero your new optics (optics if you’re lucky), break in a new build, or level a coyote. 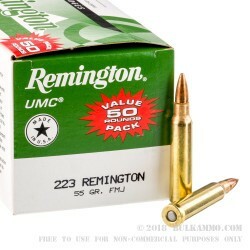 Whatever your need is, if it’s chambered in .223, you need plenty of ammo and here it is. Remington advertises a muzzle velocity of 3,240 feet per second at the muzzle, 2,759 fps at 100 yards, 2,326 fps at 200 yards, 1,933 fps at 300 yards, and 1,587 fps at 400 yards. These numbers are consistent with most other 55 grain FMJ loadings, offering a ballistic coefficient of 0.202. Go ahead and beat the rush before any further advances against our sacred freedoms gain traction and buy this up in bulk now!